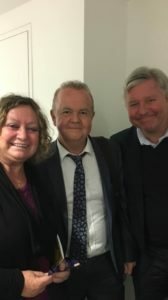 Continuing the writing theme, I went to a talk – Writing Together – given by the long-time team of Ian Hislop and Nick Newman at the Imperial War Museum on Wednesday night and very enjoyable it was. Not just enjoyable but informative and entertaining. I have to confess that I am a huge Have I Got News For You fan and love Ian so meeting him was brilliant. I sat up the front and lapped up their advice – which wasn’t just about collaborative writing but also about script-writing in general and I came away feeling I’d learned a lot and it had been a very worthwhile evening. This is what’s so great about living back in London – there’s so much going on! I had a trip to the Queen’s Theatre in Hornchurch last night with AOF*. For those whose don’t know it, it’s a brilliant 500-seat theatre that puts on amazing shows. Last night it was Once. Now, while it’s not the best musical in the world imho, I have to say the energy from the multi-talented cast was off the scale. And I loved the set, especially the way the actors moved it around. I just for a couple of the ballads a bit samey and the show was about 3 songs too long for me. But I did enjoy it. It’s on for another three weeks so if you get the chance do go and see it. And another joy of living back here is that the Daughter can come visit. And she has – so I’m in Mother Heaven at the moment. She’s had a nasty accident and is suffering but smiles and stays cheerful through it all. 💖 💖 💖 her so much! This entry was posted in Journal of Elaine Spires and tagged Barbican Cinema, Have I Got News For You, Ian Hislop, Imperial War Museum, Nick Newman, Once, Only The Lonely, Queen's Theatre Hornchurch, The Underwire Film festival by Elaine Spires. Bookmark the permalink.